Well, you can definitely say I have a thing or two, or a MILLION that need “blotting out” of my life. It’s frustrating to tackle each little something that is wrong with us. Ultimately those “little things” are just symptoms crying aloud from a bigger something. I am in an eternal arm wrestling match with my ugly little-miss-I-gotta-control-everything-please-and-thank-you mentality. My control freakishness rears its ugly head the most in dealing with my little ones. TRUTH: I am so ashamed of my eldest daughter’s first 4 years of life. Excuse my French, but I micro-managed that poor little thing so much she could hardly fart without me crawling all over her. I went overboard trying to keep her out of trouble. I was the “Soup-nazi” of mothering. I barked out orders as soon as Emily could cruise around the sides of furniture. And when she was completely mobile? Oh Lord, forgive me for the stress and agony I inflicted upon those around me. I was more worried about her touching, breaking, climbing on or destroying stuff than the people who owned it. Then one day, like a light switch, I finally started to see the impact my controlling behavior was having on onlookers. It was a sobering picture. I was pretty disgusted with who I had become…or who I already was. And my tool of sanctification named “child” was the means through which God graciously revealed it to me. Two kids later, I’m a little better, but I still run a pretty tight ship. And I don’t mean that in a super-mom kind of way where everything ebbs and flows smoothly around the house. I mean it in the “crazy overbearing mom” way where “You best be obeying your mother,” or consider yourself shark bait. Buy why? Why do I have such trouble letting them be themselves? I’m worried they’ll do something, anything…EVERYTHING. They might embarrass me, or inconvenience me or they will just plain irritate me. I feel like a failure of a mother and wife—and a person in general. How can I possibly reflect Christ if I am being controlled by my desires and not His? Behaving like a selfish brat and forcing my hand to get everyone around me to conform to my will does harm not good, even if it results in me “getting what I want.” Instead, I should be submitting to God’s control and seeking to conform to HIS will. Enter the extremist in me. It can be tempting to take on a defeatist attitude, throw your hands up and say “Well, there’s no way I can fix this.” This is where I am so tempted to quit. So tempted. But I have to take that thought captive. And replace it with TRUTH. What about the fact that I have the source of all the power of God and Heaven living in me?? This is what I need to focus on. Christ in me=All I need to escape the vice grip of being a control freak. A declaration like this is a virtual invitation-no, more like a DARE for the attack to show up on your doorstep. It’s not because the fight got any worse, but instead, now you have eyes to see the battle. And it’s fierce out there. Peace that my children have to be children, but I need to train them in Godliness. Peace that something might get broken, but no amount of barking will prevent it if that is what my sovereign Lord allows in order to teach me more about Him. Peace that God ultimately controls everything, and I need to TRUST Him to do His job while I do mine (obey). Peace that Jesus Christ has FORGIVEN all my past, present and future sins, and that God “blots out my sin” from the pages of His memory. And I should do the same. Does this mean that I never fail anymore? And sometimes I even find myself looking back. I’m waving the white flag in the face of the control I never owned, but fought so hard to hold on to. And I am learning to embrace the freedom of knowing I am eternally safe in the grip of God’s control. I really like to be in control, too! I am slowly letting go of this unrelenting desire to be in control all of the time, but it’s not easy! It sounds like you have come a long way in tackling your “control-ish behavior.” I don’t have kids yet…but I imagine that this is sooo much more difficult with kids. 🙂 I join you in your freedom walk! Laura, I’m so glad this got your wheels turning! And yes! Join me on this walk! 🙂 Happy to linkup with you! What a comfort to hear that I am not alone in this! I honestly knew I wasn’t, but now two brave people have come along side me and have encouraged me! 🙂 BTW, 14 is a dirty word over here. petuweee (spits, lol) We are keeping them 10 and under in my house! lol!!! 🙂 Blessings back at ya! Oh my, I can sooo relate here. 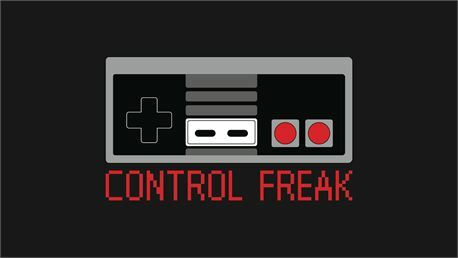 I am the “control freak” around here. And you’re so right, it affects every area of your life. I’ve learned, after few weeks of almost losing my mind, that I have to hand this over to the Lord. But, yes, it’s still a daily struggle. I’m so thankful for His grace!! Thanks for linking up with Grace & Truth this week! I hope you’ll join us again next week! I struggle with the same thing only it’s with my husband. God has been showing me how to stop trying to control my husband and instead allow God to be in control of MY life. So far I have found great peace in letting go. I always thought it would cause greater anxiety, but it’s true that God’s peace really does pass all understanding. I totally get your post. I’ve slapped on my Mrs. God badge so often that I need a new one. However, as I get older and walk more closely to Christ, I’m controlling less, because I realize that I really have very little true control. Bless you for linking up such a challenging post at Grace & Truth! Leah, beautiful post here. Unfortunately I can absolutely relate. My oldest is five and I’m beginning to see some of my parenting flaws reflected in him. But God is so gracious and sovereign over our mistakes and failures. This brings me so much hope.